In case you missed the news - never have there been so many natural disasters in so many states leading up to, and during the ORC. Between Texas, Florida and California, many participants have had to endure unusual circumstances that have impacted their projects in many ways. 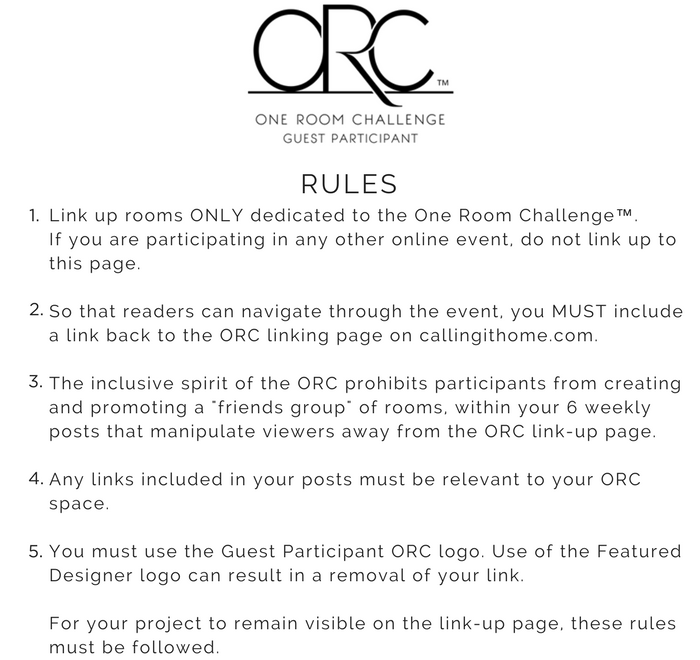 Since its beginning, the One Room Challenge™ has been described as a place to redesign a room amongst other design enthusiasts in a supportive, noncompetitive environment. In that spirit, the ORC team believes some flexibility is in order. To best support all of the hard-working, talented designers during this challenging time, a one week extension has been granted. What does the additional week mean to you? More inspiration, creative ideas, and motivation for your home. Within these links are amazing wall treatments, stunning furniture transformations, and every room color combination imaginable. I'm now so motivated to get back to the rooms I haven't finished! Guest Participant Room Reveals - Thursday, November 16th! I'm excited to see all of the progress! Remember to 'subscribe' to the sites you are enjoying. It's always great to receive an email post from one of your favorite sites.